After managing an account for a while, it is easy to fall into the same routine updates. The performance is solid, the stakeholders are happy, but it can be hard to escape the feeling that maybe you’re missing something. An AdWords account audit can be the best way to mine for areas where some revenue might be escaping or some costs might be sneaking right by and impacting the bottom line. Having audited thousands of AdWords accounts over the years, I’ve found that even the most tightly-run accounts benefit from approaching it as an outsider and auditing the work, even when it’s your own. There are a million ways to audit an account and some really specific things you can dig into to find anywhere you might be leaking cash. Here are some of my go-to ways that I check in on myself as a manager from time to time. 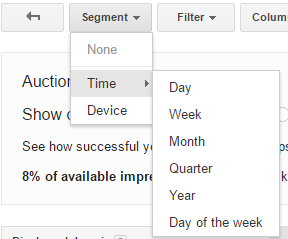 Notice that this setting gives Google permission to show your ads outside of your core targeted area. These additional users are defined as those who show interest in your targeted area, be it via terms used in their other searches, or viewing content related to the targeted location. So, in other words, they aren’t in the location you’re actually targeting! To see how these two very different audience types perform, go to the Dimensions tab and choose “View: Geographic,” and add the Column for Level of Detail > Location Type. There’s a notable difference in CPA between these two audiences. 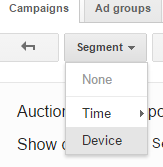 Changing your Advanced Location Targeting Settings to be people only in and out of your Excluded Location can keep your ads only showing to those audiences who are showing they actually convert if you decide the difference in CPA or ROAS isn’t worth the extra volume it provides. 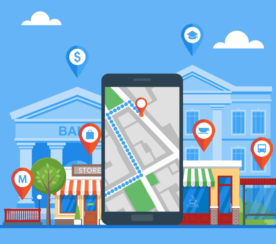 Likewise, pulling performance by User Location can help you easily spot where certain geographies might be driving up your CPA or ROAS (strategies for situations like this are covered in Tip #4). I’m a self-admitted control freak about how search queries match to my campaigns. Some will always slip through, but it can be easy to miss queries consistently matching to the wrong ad group when you’re just looking through the Search Query Report. 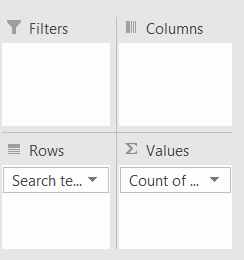 I’ve found that it’s far more beneficial to pull an Excel table and create a quick pivot to instantly make matching issues evident visually. 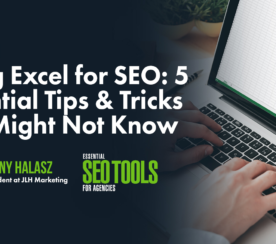 Download your terms and open the .csv in Excel. 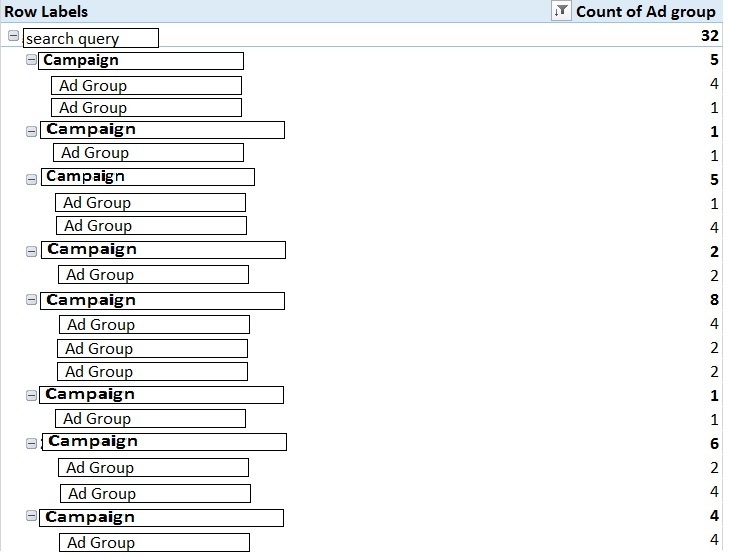 You will have a long sheet with rows of search queries, and columns denoting Campaign and Ad Group. You will see duplicate search queries, which is why this report is so helpful. If a search query is matching to a bunch of different ad groups, it can be really hard to see or figure that out in the Search Query Report view within AdWords. This immediately shows the search terms and how many ad groups they are matching to, so it’s evident quickly if there are any issues. 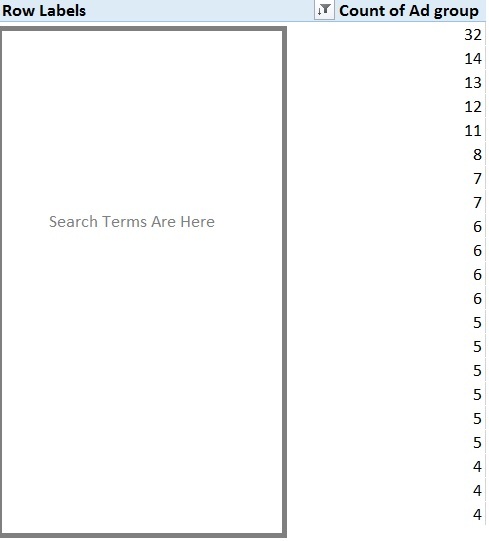 For example, that first search query is being matched to 32 different ad groups – yikes! In this particular instance, it’s account structure that is replicated among many geographies, so there are many identically-named Ad Groups. In this case, I would expect it to be matched multiple times, but certainly not this many – just something to keep in mind when you see a term matching to more than one place. To make short work of zeroing in on where it’s matching to multiple places within each Campaign, tweak the pivot table a little. 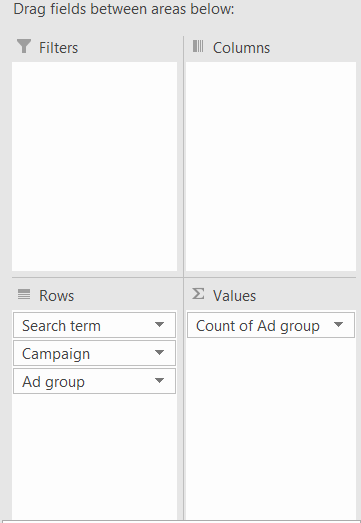 Drop “Campaign” and then “Ad Group” into the Rows field, underneath the already-existing Search Term area. Make sure you also keep the count of Ad Group in the Values still. It’s easy to get wrapped up in your own performance and forget that things might be changing in the auction itself. One way to keep tabs on competitors and any of their moves is using the Auction Insights tool. This shows you who you’re competing with, and allows you to see how you stack up against them, what your impression share is like versus theirs, and segment it by time or device. While interesting, it isn’t particularly actionable. However, there are a few field options you can add that help this data become something a lot more useful. 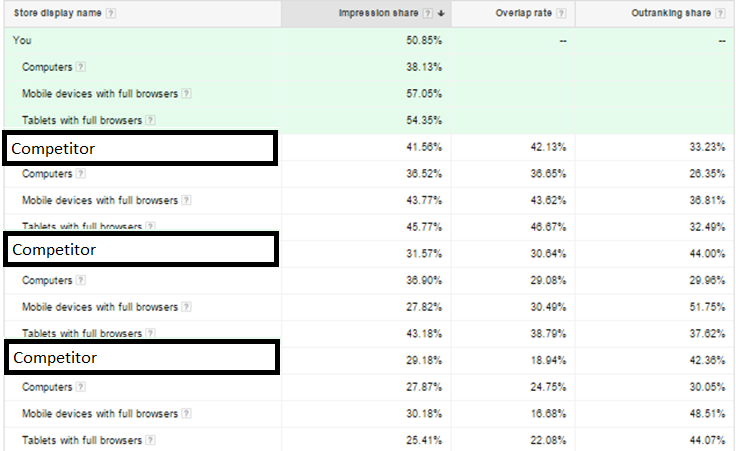 From here, you can see your own stats and how they compare with your competition, specifically in regards to mobile, giving you insight as to who you’re competing on more so in mobile vs. desktop. 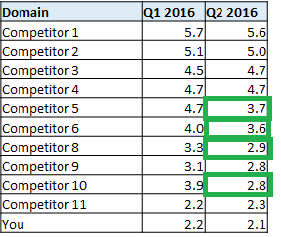 You can also export competitor results over time, which can be valuable to check in on quarterly. It gives a sense of who might be spending more, who has made obvious account improvements, and who you might need to start watching closer than you did before. For some more great information on using Auction Insights, check out this write-up over at Search Engine Land. This one requires that you really take a fresh look at where your account is from a structural standpoint to evaluate if it’s time to change it. This has less cut and dry steps because so much of it depends on the business type of the account, the performance, and any limitations that might exist. Do the campaigns contain tons of Ad Groups? If so, does performance really just come from a handful of them that would benefit from being their own campaign(s)? Is there more that could be spent but budget caps are preventing it? If so, you may want to consider promoting the Ad Groups to their own campaign so you can allocate as much budget as possible to them. Similarly, do you need to start breaking out some exact match keywords into their own ad groups? This realization can come from using the match type data you pulled in Tip #1 above. 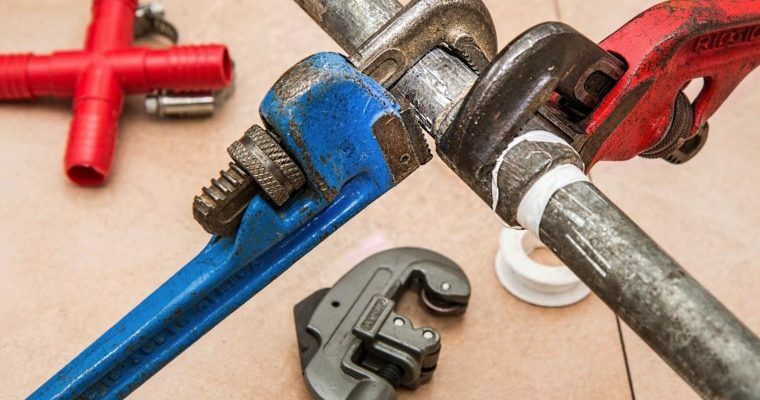 Be on the lookout for high-converting terms that may not be getting everything they should be because of mixed match types, or multiple matching situations. Is geography playing a part? Bid modifiers will sometimes only get you so far, and eventually, you know you need greater control. Look for geos that are sucking your budget dry that need to be capped, or vice versa. Consider grouping geos together into campaigns or even isolating some on their own, if needed. Every account has its own challenges and quirks, and it’s easy to become blind over time to new opportunities. 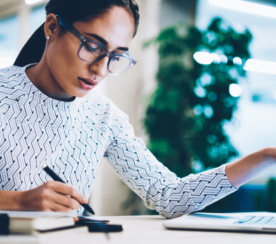 Taking a fresh look at the data and performance outside of your regular routine will help you uncover areas where performance could be improved even further, and new ideas for moving the account forward can be tested. Screenshots by Susan Wenograd. Taken August 2016.